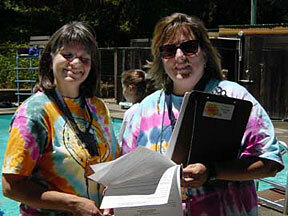 Arequipa Day Camp is staffed by volunteers from our Girl Scout community. Working at camp is an opportunity to have fun, feel like a child again and enjoy the outdoors. Every full-time volunteer who joins our staff allows six campers to attend that session of camp. We can only offer our day camp to girls if adults volunteer to come and have fun with us! » You’ll be able to apply for FREE through January 31. Thereafter, there is an application deposit fee of $25, refundable after camp assignments have been made. ∗ As a full-time volunteer (5 days in camp), your first daughter attends camp free of charge, your other daughters attend at a discounted rate, and they receive priority acceptance. ∗ As a part-time volunteer (3 days in camp), children attend at a discounted rate, but do not receive priority acceptance.